Over the last few weeks, I’ve received several emails from readers asking about my favorite Bible journaling tools. I first began Bible art journaling in May this year and let’s just be honest, I’m not the kind of artist who can draw or paint the seventh wonder of the world. However, I have stuck with the Bible art journaling because I found myself fighting distraction and fatigue while spending time in God’s Word. I love reading and studying the Bible, but I needed something to help me focus on the Word and enjoy a little more time meditating on it. So that’s how I began Bible journaling. Gradually I started learning a little more and little more. I wrote about the reasons I learned to love Bible journaling. And I decided to find the best resources and tools that would work for me. Notice “work for me.” I’m not an artist. So artist’s tools probably wouldn’t work for me. But I was only partly right about that. After months of trial and error, today I’m sharing my favorite Bible journaling tools. Tons of folks were asking about my Bible when I started posting a few color scratches on my Instagram and Facebook feeds. 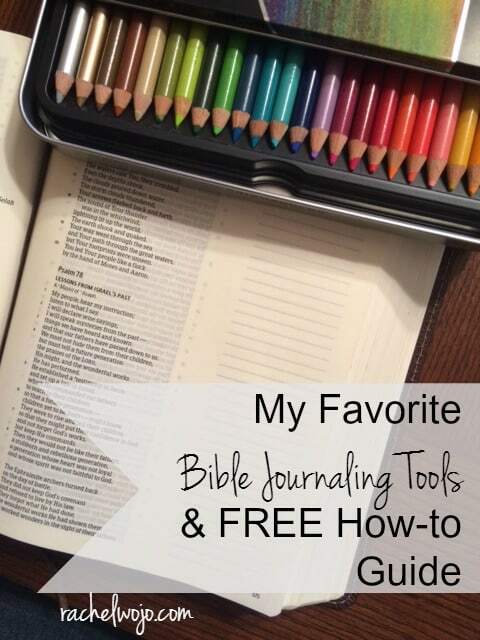 I chose to write an entire post addressing the various journaling Bibles and which one I enjoy the best, so if you want to purchase a journaling Bible, check it out. Otherwise, keep in mind that you don’t have to journal in your Bible, a separate blank journal will work just as well. Since I’m not a big artist and just learning, then I pencil a LOT! I just use a regular number 2 mechanical pencil, nothing fancy. Ok, seriously? I don’t use a straightedge. Some of you will hate me for this; some of you will love me. But since my goal is to spend time in the Word each day and focus on what God has for me in those few minutes, I don’t want to be perfectly picky. Everything is eyeballed. (A truly technical term, huh?) But if you want a straightedge, go for it! This is about how you work and how you function. If perfectly straight lines give you a focus on Jesus, then zoom in, Sister. Zoom in. After some trial and error, I discovered a couple favorite ink pens.For black ink, thick and thin lines, I love the Zigwriter. But I know plenty of folks who use Sharpies. I have found that the Zigwriter doesn’t bleed through the pages, especially if you are using thinner pages. The Bible I use has thicker pages and I don’t have to worry about ink bleeds so much. But you can always place a piece of paper behind your work. The Zigwriter pen I use is .5 mm for fine control and 1.2 mm for the bullet tip (thicker lines. )For defined control, I really LOVE Micron pens. So much so, that today I plan to order another set. The first set I have is a fine line color set .20 mm. A No-No- When I first started Bible journaling, since I’m not an artist, I started trying with the Bible highlighters that so many people were talking about. These highlighters are GREAT for highlighting verses, but not so great for drawing or true coloring. So I hardly use them and don’t recommend them for artistic efforts. Crayola: Then I tried Crayola watercolor pencils and they are ok, but I couldn’t make the coloring look as smooth as I wanted it . 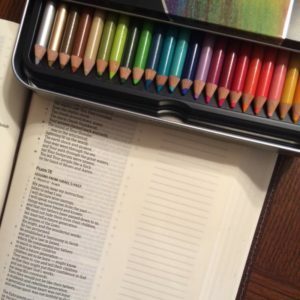 Artist’s Loft: I chose a set of Artist’s Loft watercolor pencils from Michael’s (using a 40% off coupon! yep, Mom to 7) and they were better. If you are on a budget or new to journaling, I think you’ll love them. Pray briefly. A simple prayer giving the time to God and asking him to speak to me through his word is all I offer. If you want or need more prayer time, then feel free to do that! But my prayer is usually very simple, telling God I’m here and I want to listen to what he has to say to me through his love letter. Read the passage at a normal pace. The monthly reading plans I pull together here are concise by design. On the average, we read between 7-10 verses. Read the passage a second time at a slower pace, focusing on each word. Note the phrase or verse that speaks the loudest to me. Highlight it or underline it. Write the highlighted phrase or verse on a piece of paper. Thank God for this word and talk to him about what this means. Place a piece of paper over the journaling Bible section that I want to sketch. Sketch the writing and doodles in crudely on the piece of paper as a basic outline. Relax and meditate on the phrase as I doodle, thinking of words that are similar to the words I’m copying and praising God for his word and this moment in time. Place the paper beside the Bible and pencil in the basic outline into the journaling Bible. Erase and correct outline as desired. Continue to give my thoughts to the Lord, asking him to help me remember this message for today and focus on this phrase for the day. Use a black ink pen to finalize basic outline. Use colored pencils to color in basic design. Praise Jesus for the light and life he brings to the world and for the gift of color. Choose accent colors and attempt shading and accents. Pray a simple prayer thanking the Lord for time to focus and love on him as well as receive his love for me. Ask him to continue to be with me throughout the day in all I do and say. Alright! I’m super excited to share this FREE Printable How-To Bible Journaling Guide to accompany the monthly Bible reading challenge we begin on Nov. 1st, One More Step. Click here or on the graphic below to open a printable pdf for the free guide. What are your favorite Bible journaling tools? If you’re just getting started, which part of this article is the most helpful to you? The Stepping Stones Journal is the free printable Prayer and Scripture Journal that serves as a companion guide to my book, One More Step. The How-To Guide in the above article is a supplemental guide to doing the One More Step Bible Reading challenge or learning how to Bible journal through any passage. If you’re looking for the Gently God Guides Bible reading challenge summary for this week (our usual summary is every Friday), then since we are at the end of the month, I’ll post the summary tomorrow to close out the challenge and the month. One More Step Bible Reading Plan begins Sunday! Don’t forget to start the One More Step Bible reading plan on Sunday, Nov. 1st and be sure to check out my new release, One More Step: Finding Strength When You Feel Like Giving Up! I am already floored at what God is doing through One More Step. I can’t wait to begin the Bible reading with you on Sunday! See you then! Thank you for this post and free guide! I am a beginner, too, and find this to be very helpful. I love studying the Word and love finding this new method. Thank you for sharing what you have learned. I’m excited to start bible journaling and can’t wait to see where it takes me! Thank You for this helpful info. Really needed a how to start deal as I am worrying about messing up my Bible. I want to be able to read the scripture still but am also not the greatest artist either. I thought you’d want to know the link to the Prismacolor Premier pencils is broken. Also, you mentioned using watercolor pencils, but this link is for Prismacolor Premier soft-core colored pencils (not watercolor). Have you used both? Which ones did you find best? Personally, I’m not sure I want to wet my Bible pages to blend like I assume one would have to do with watercolors. Thanks for turning me onto this awesome Bible study tool! What a great Christmas present! 🙂 The watercolor pencils I used were other brands. Under the Prismacolor section, those are colored pencils. Check the link again- it should be working. Thanks for letting me know it didn’t work for you!! I have not used the watercolor, but I know others who have. I’m a pretty simple person so the regular colored pencils have been enough for me. 😉 Enjoy!! I know you’ll love it.